Unearthed beneath an ice floe in the Pazyryk Valley in the Altai Mountains of Siberia, the Pazyryk Carpet was found in the grave of a Scythian prince in a rare archaeological excavation of the region in 1949, and is considered the oldest known carpet in the world. Radiocarbon testing showed that it was woven in the 5th century BC. Uniquely preserved, archaeologists were surprised by its advanced weaving technique for the time in which it was made. This indicated a long history of evolution and generations of experience. Persian carpet experts believe it to be the greatest achievement of over a thousand years of history. This means that Persian carpet-weaving has existed for over 3,500 years. Depicting a deer and Turkish horsemen, its dark red coloring is still vivid and remarkable. It measures 1.83×2 meters and has thirty six symmetrical knots per centimeter squared. 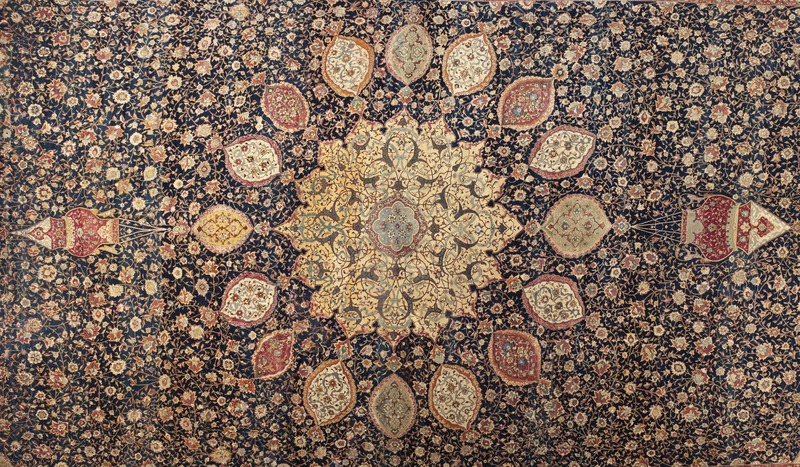 In order to revive and develop the art of carpet-weaving in Iran, the Carpet Museum was founded in 1978 to honor one of the most distinguished manifestations of Iranian culture and art. The Museum was established with a limited number of Persian carpets and kilims, including the Pazyryk Carpet, which is still on display today.